Sorghum [Sorghum bicolor (L.) Moench] is well known for its great potential to produce grain, feed, and fuel under stressful conditions such as drought and heat. However, its genetic potential to withstand cold, wet environments at germination has not been extensively exploited due to limited sources of early season cold tolerance. The objective of this study was to select novel, not previously characterized, cold-tolerant sorghum accessions that can germinate in a traditional cold test at 10°C in the laboratory and emerge in the field under a wide range of stressful conditions. Fifty six accessions (38 Kaoliangs and 18 non-Kaoliang of different geographic origin) were screened in the laboratory using a 7-d and a 14-d cold test at 10°C with soil, and they were also evaluated under early planting conditions in the field at two locations in the Midwest. The 7-d cold test was the best predictor of seed emergence in the field (r=0.50-0.61), while the standard germination test overestimated field performance. Twelve of the top 15 accessions exhibiting cold tolerance in the 7-d cold test were also ranked within the top 15 under field conditions. Eight novel accessions were identified in this experiment with potential superior alleles for cold tolerance. Breeders could perform preliminary screening of germplasm for cold-tolerant alleles in the laboratory using the 7-day, 10°C cold test. 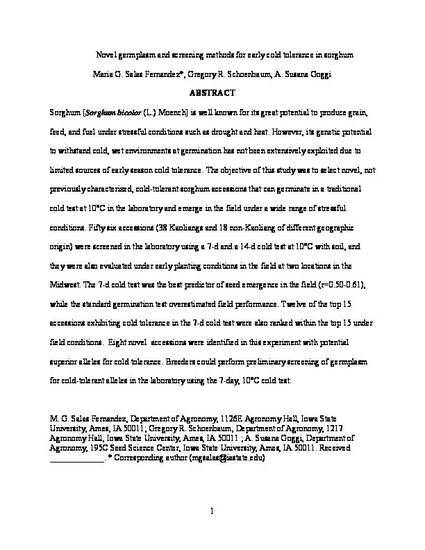 This is a manuscript of an article published as Salas Fernandez, Maria G., Gregory R. Schoenbaum, and A. Susana Goggi. "Novel germplasm and screening methods for early cold tolerance in Sorghum." Crop Science 54, no. 6 (2014): 2631-2638. doi: 10.2135/cropsci2014.01.0025. Posted with permission.